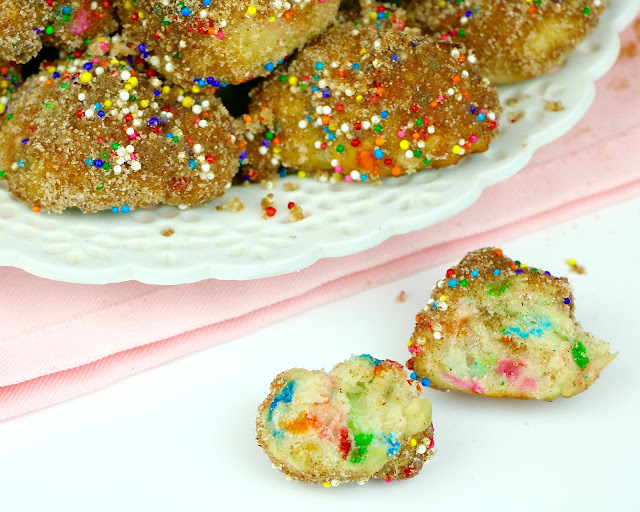 A funfetti-fied version of one of my favorite pop-able snacks. These soft pretzel bites are perfectly soft, yet chewy and covered in warm cinnamon sugary goodness. But best of all, they're packed with rainbow sprinkles, and served with a sweet dipping sauce. Every time I go to the mall I always walk by the pretzel store and snag one of those little samples they give out right outside the door. 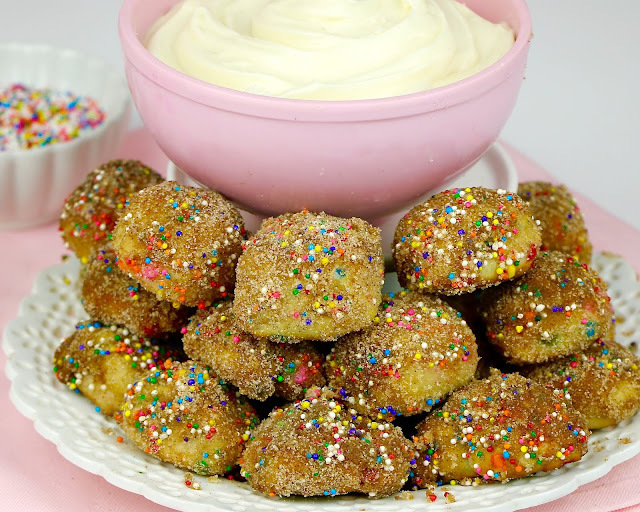 And you know me, I choose sweet over salty every time, so instead of dunking these soft little pretzel bites into mustard, we are coating them in rainbow cinnamon sugar and dunking them into a thick, creamy bowl of sweet cream cheese icing. 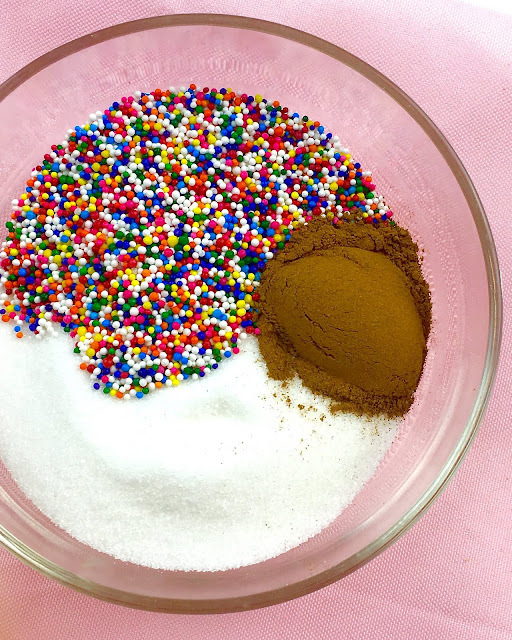 They have brown sugar, butter, vanilla and of course sprinkles, all throughout the rainbow speckled dough. And I like to use milk, instead of water, like most pretzel dough recipes, to make them extra soft, tender, and cake-ier. The dough is actually really easy to make, so you don't have to be scared of baking with yeast. 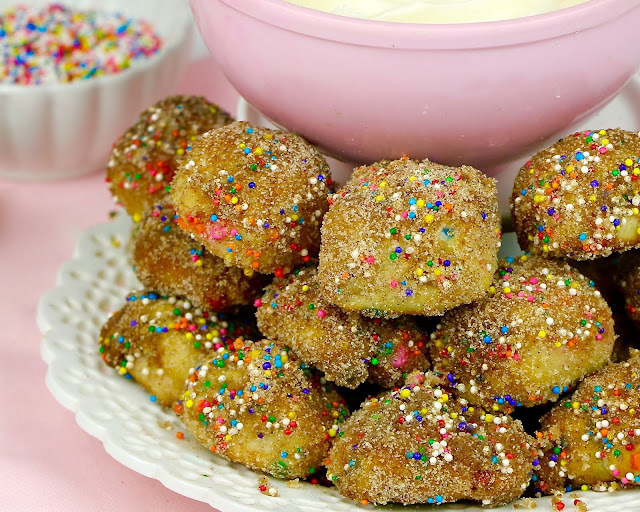 They come together in under an hour, and you don't need an electric mixer to make these. Just make sure to use instant or rapidrise dry yeast, instead of regular, active dry yeast, so you don't even have to wait hours for the dough to rise. The one step that sets this recipe apart from any other dough, and makes it a real pretzel recipe, is taking the pretzel bites for a dip in a baking soda bath, right before we bake them. It sounds a little weird, but it's what gives the pretzels that iconic flavor and golden brown color. If you skip this step this recipe will still totally come out perfect, it just gives them that perfect pretzel flavor. 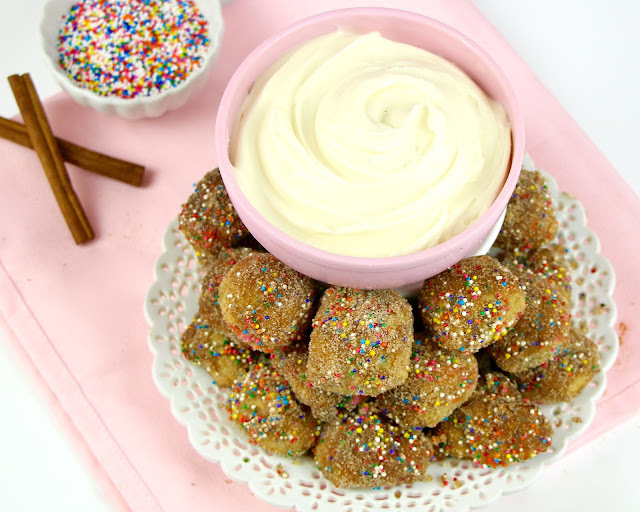 You can serve these little bites as is, but I'm telling you, this cream cheese dipping sauce is everything! 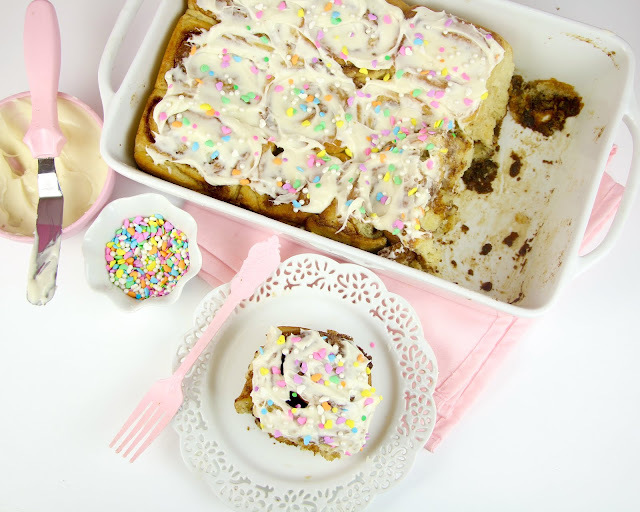 It is my favorite cream cheese icing in the entire universe, and the smooth, creamy cool icing just pairs so perfect with the warm crunchy sprinkley cinnamon sugar. 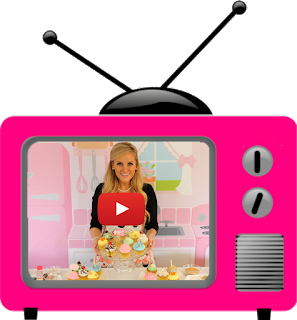 ...or my Funfetti Soft Pretzels with Sweet Glaze, so be sure to check those videos out too! In a large bowl (or bowl of your stand mixer), whisk together warm milk, instant/rapidrise dry yeast, sugar, 2 tablespoons melted butter and vanilla. Add 1 cup of flour and salt. Slowly mix in remaining flour, with a spatula (or dough hook attachment on your stand mixer on low speed) until dough starts to form and come together. 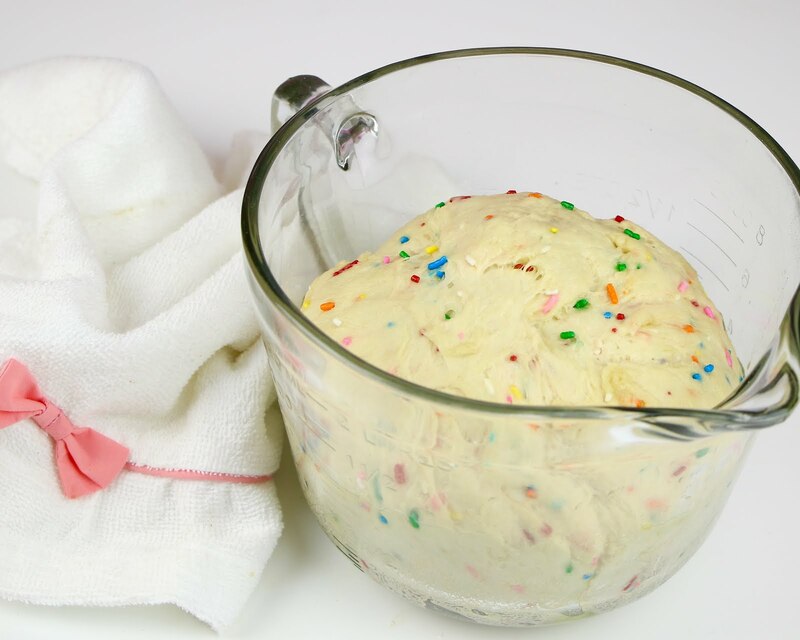 Add sprinkles and knead (by hand, or on medium speed in your mixer with the dough hook) until the dough is smooth and elastic, about 5 minutes. 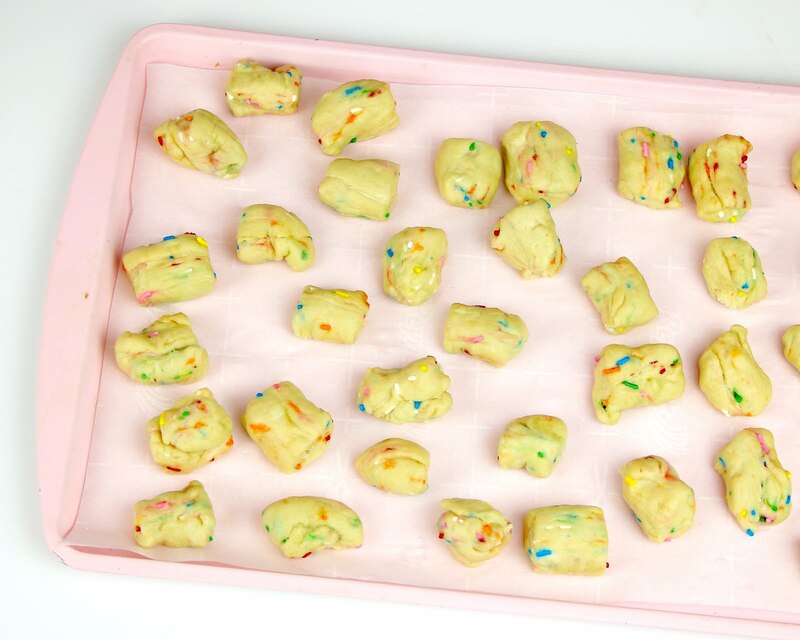 Form the dough into a smooth ball and place in a bowl coated with vegetable oil. Roll dough in bowl to coat in oil. Cover with a towel and place it in a warm, draft-free place to rise for about 20-30 minutes. Meanwhile, preheat oven to 450°F. Line 2 baking sheets with parchment paper and set aside. Bring the 4 cups of water and the baking soda to a rolling boil in a large saucepan. After 20-30 minutes, punch the air out of the dough and turn out onto a slightly oiled work surface. Divide into 12 equal pieces, using a pizza cutter or sharp knife. Stretch the dough into a long rope by pulling on each side and swinging it around like a jump rope, slapping center onto the countertop on the way down. Cut each rope into 6 bite size pieces. 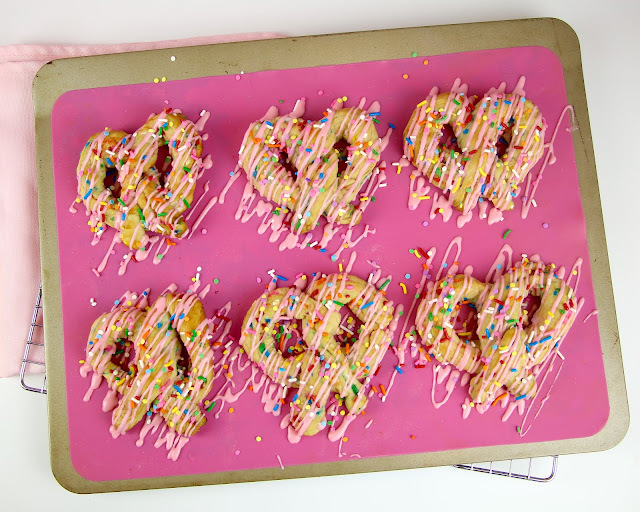 Using a slotted spoon, drop a few pretzel bites into the boiling water for 20-30 seconds, lift out of the water, allowing excess water to drip off and place onto prepared baking sheet. Do not let dough soak any longer, to avoid a metallic taste. Repeat with remaining dough. Brush pretzels with a dab of the melted butter, reserving the rest for dipping after baking. Bake for 8-12 minutes or until golden brown. Meanwhile, make the dipping sauce. Beat together cream cheese and butter until smooth. Add vanilla and powdered sugar, beating until smooth and creamy, adding milk as needed until you have a perfect dipping consistency. 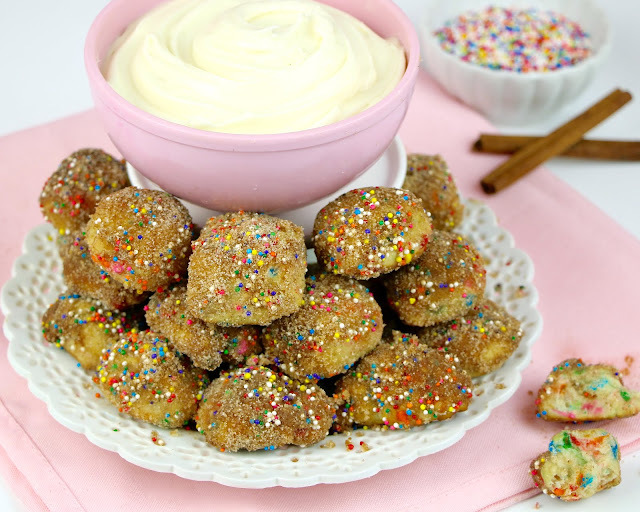 For the cinnamon sugar coating, whisk together granulated sugar, nonpareils and cinnamon until well blended. 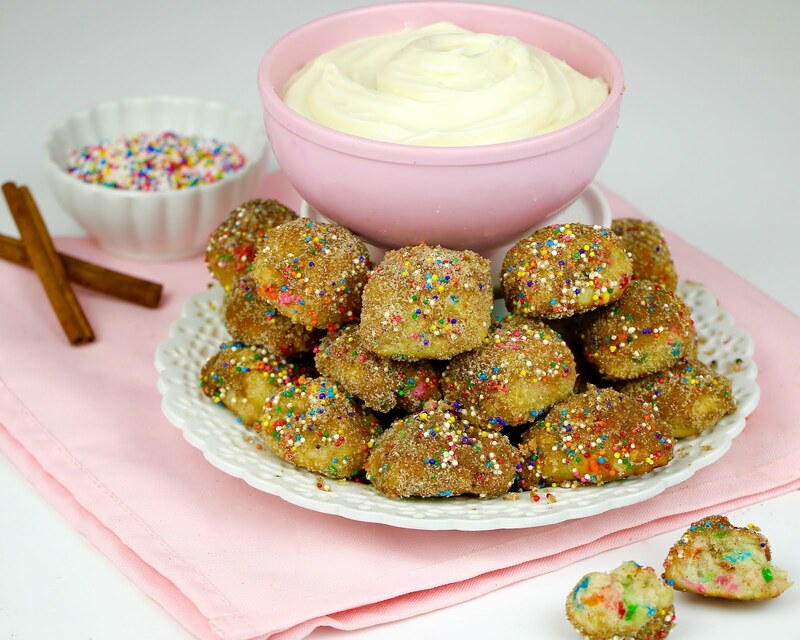 Remove pretzels from oven and dunk into melted butter, shaking off excess. Toss in cinnamon sugar to evenly coat. Serve immediately or store in an airtight container at room temperature for up to 3 days, or frozen for up to 2 months. Reheated in a 400 degree F oven, until warm. Pretzels are best enjoyed, fresh, the same day.